"We wanted to drive home our technology support role in a big way this year, while once again focusing on the personalities of the SHR drivers who depend on Mobil 1 to help them reach peak driving performance." DAYTONA BEACH, Fla.--(BUSINESS WIRE)--Throughout the 2016 NASCAR® Sprint Cup Series season, Mobil 1™, the Official Motor Oil of NASCAR, will spotlight Stewart-Haas Racing’s No. 4, No. 10 and No. 14 cars with primary hood sponsorships. At the same time, ExxonMobil wishes Tony Stewart a speedy recovery from his back injury and looks forward to welcoming the three-time series champion to the track for his final season as a Sprint Cup driver. In addition to Mobil 1 hoods on select SHR cars throughout 2016, Mobil 1 will continue to serve as a co-primary sponsor of Stewart’s No. 14 Chevrolet and season-long associate sponsor of Harvick’s No. 4 Jimmy John’s Chevrolet, Danica Patrick’s No. 10 Nature’s Bakery Chevrolet and Kurt Busch’s No. 41 Haas Automation/Monster Energy Chevrolet. 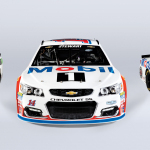 Mobil 1 lubricant technology will be used in all four SHR cars during the 2016 season. While SHR drivers will represent the Mobil 1 brand to NASCAR fans in 2016, the technology partnership between Mobil 1 and SHR has never been as basic as a logo on a car. The 2016 Sprint Cup season continues a symbiotic engineering relationship used to create lubricant packages and push technology limits. This relationship helps the team win races and Mobil 1 improve the quality of lubricant products for consumers. Mobil 1 and SHR’s partnership is approached as any other new research and development project: data driven, extensively evaluated and tested. After announcing the partnership in 2010, SHR and Mobil 1 engineers began working closely together to tackle racing challenges, while adapting to every NASCAR rule change great and small. Since the 2011 season, the partnership has led to significant on-track success with two Sprint Cup titles, 23 wins, 112 top-five finishes, 189 top-10 finishes and 22 poles. Impressively, in Kevin Harvick’s 2014 and 2015 Sprint Cup seasons – Harvick’s first two with Mobil 1 lubricant technology support – he led more laps than in his previous 13 seasons combined. Just one year after winning the Sprint Cup in 2014, Harvick was the runner-up for the 2015 Sprint Cup championship. When the green flag drops for the 2016 season, Mobil 1 Racing will be directly supporting SHR drivers with more than 100 combined total Sprint Cup wins. The Mobil brand’s history in motorsports officially began in 1979 with a sponsorship of Williams Formula One Racing Team. From that time, the presence of Mobil 1™ technology on race tracks and circuits has grown by global proportions. Today, Mobil 1 synthetic motor oil is relied on for its ability to deliver exceptional engine performance and protection even under some of the most extreme conditions by team owners and many of the world’s leading automotive manufacturers. Along with its status as the Official Lubricant Technology Partner and Official Motor Oil of NASCAR, Mobil 1 enjoys a long association with many of world's most popular and successful race teams, including Stewart-Haas Racing in NASCAR’s Sprint Cup Series, McLaren Honda Formula One team, Corvette Racing’s WeatherTech SportsCar Championship team, Tony Stewart Racing’s World of Outlaws Craftsman Sprint Car Series team and the Falken Tire racing drift team. Mobil 1 also serves as the title sponsor of the Porsche Mobil 1 Supercup and the Official Technology Partner of the World of Outlaws Sprint Car Series.